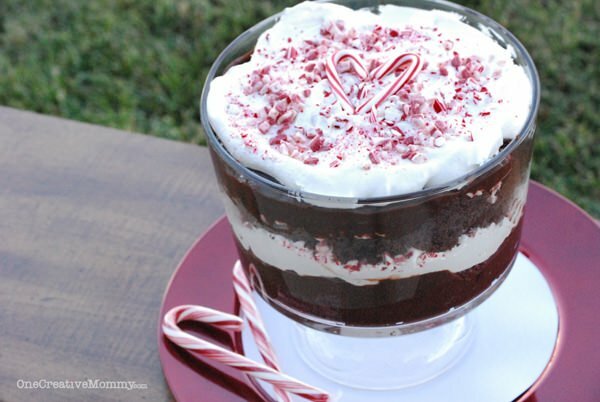 If you love chocolate and peppermint, you’re going to love Chocolate Peppermint trifle! Be sure to serve this for company, because it’s so easy and delicious that you won’t be able to quit eating it! I hope you’ve been enjoying my 12 Days of Christmas series. I’m loving the projects and recipes shared by the guest bloggers. 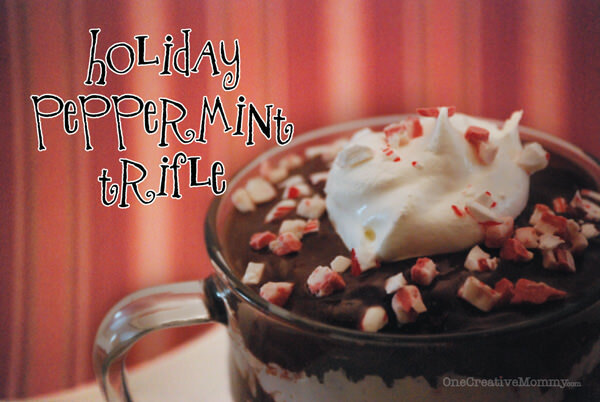 Today I’m taking a break from the series to bring you an amazing peppermint dessert. The 12 Days of Christmas will continue tomorrow. WARNING. 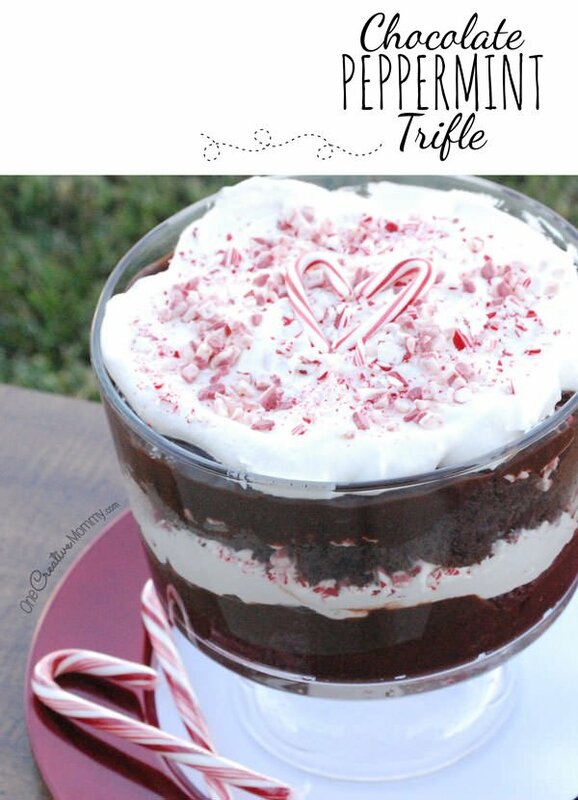 Chocolate peppermint trifle is seriously addicting! My husband and I ate the whole thing ourselves in just two days! Last week, I shared the gluten-free version. Today I’m sharing the original recipe–gluten and all! 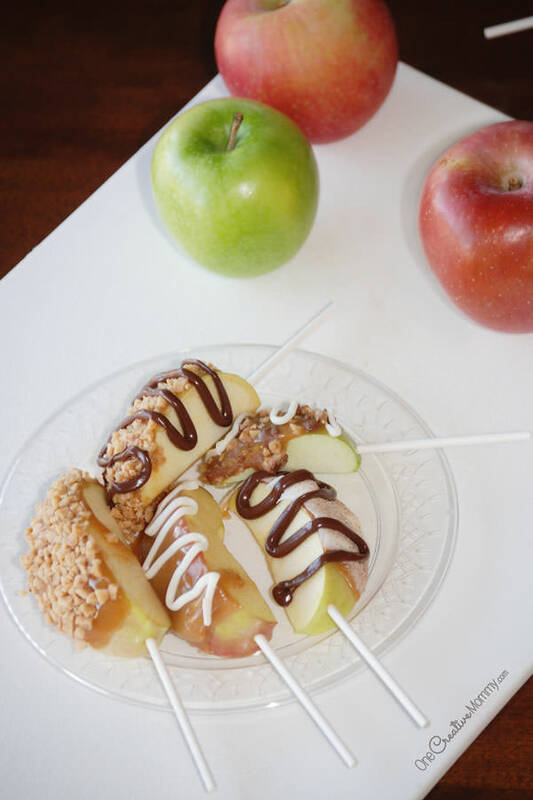 This recipe is super easy and super yummy!! Cut cooled cake into cubes. Cover the bottom of your bowl with cake pieces. Top with 1/2 of the pudding. Top with up to 1/2 of the whipped topping. Sprinkle with candy cane and Andes peppermint bits (up to 1/2 of the mix–depending on how minty you like it). Repeat the layers. *You can easily use only Andes or only candy canes. Both are equally yummy! Whether you need dessert for your Christmas party or dessert for one or two, this recipe has you covered. You can make a full recipe or just a small one. It can be layered in almost anything! . . . a giant mug . . . a mason jar . . . 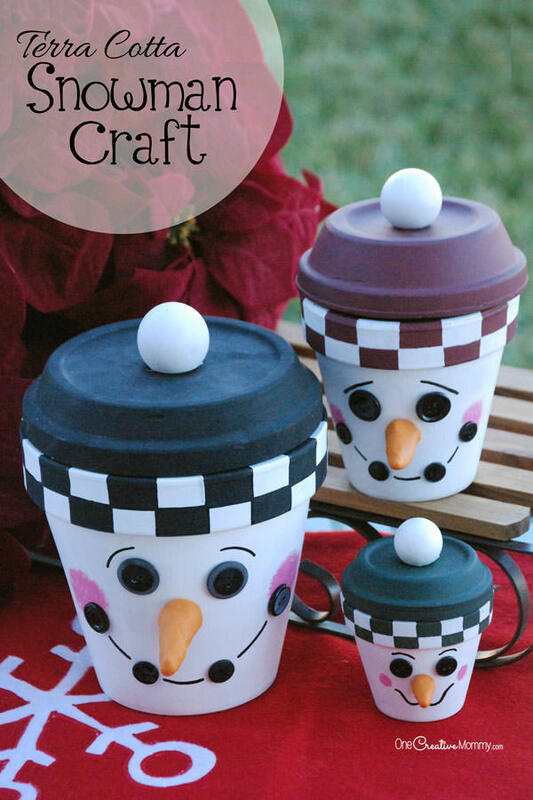 Freeze individual portions for later, or add a ribbon and a cute jar topper (download mine here) for a great gift to a friend or neighbor. I don’t know about you, but I am seriously craving some chocolate! I think it’s definitely time to make another batch! Thanks for the party, that Triffle looks amazing! I just bought a Pampered Chef Trifle Bowl! 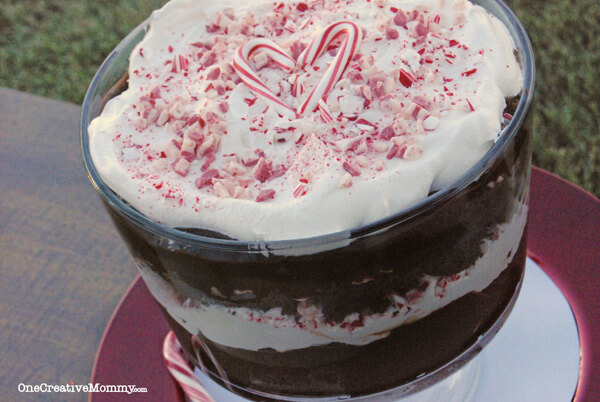 I have got to make this peppermint chocolate whipped topping cake! Looks yummy! I just linked some more minty-chocolately goodness! Thanks for the party! I’m giving my daughter a Vera Bradley bag that she has wanted for months!! OMG that trifle! You are a temptress! What if you made it with brownies instead of cake? Would that be too sinful? Thanks for hosting. Have a great week! Thank you so much for another awesome party!! I have added the Twelve Days of Christmas on my blog, and will include it in my next post. Hope you have a great weekend. Wow, you are starting early for the weekend! Love it :) Thank you for hosting the party and taking the time to do it. I am excited to give something to Mr Man that he has wanted over a year. I saved and this year he will get it! Your chocolate trifle looks so yummy!! Thanks for hosting! Have a great week-end!! Such a fabulous giveaway and party thank you for hosting! I am excited to surprise my mom with a new purse! I Pinned and shared your trifle. It looks scrumptious and so easy. Thanks for hosting and sharing this week! Thanks for the wonderful party. I love coming here every week. Heidi, you’ve got our number with that chocolate trifle! Individual Trifles…love it! Signed up for your fabulous give away too! Looks so yummy! Thanks for hosting! Have a holly, jolly weekend! Oh my gosh, this is insanely easy and so incredible looking!!! Love this dessert! Oh my, that looks so delish! Thank you for hosting this great Giveaway and thank you so much for participating at SHOW-licious Craft Showcase! Would you stop it with the yummy treats…??? 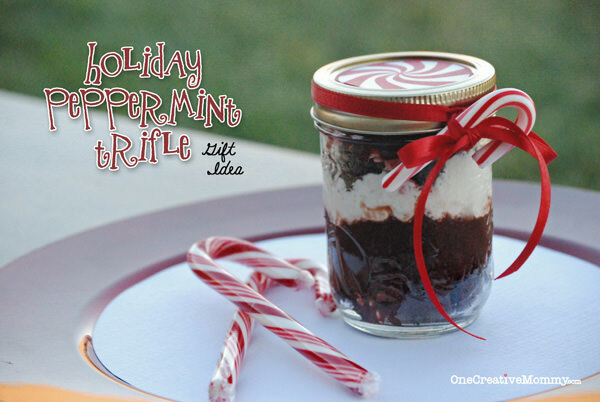 I am trying to NOT gain weight over the holidays and this looks WAY to yummy to resist… And it looks so adorable in that jar…. what a great gift! Thanks for having a fun party! The trifle looks AMAZING :) We will have to give it a try! It looks amazing, and I am sure it tastes it too! Thanks for sharing on Super Sweet Saturday. This looks so good and easy! I’m definitely going to make it! That Trifle is amazing! Thanks for linking up at Show Me Your Plaid Mondays! I would love to get some $ or a gift card to pick out some items I want for my home. Oh, how delicious!! It looks great too. Thank you for sharing at Sharing Saturday!! I am most excited to give my daughter her gift which is mostly homemade reversible playmat of a zoo (with homemade animals) and a castle (with bought castle blocks and figures). Heidi, this looks so delicious! I love mint & chocolate together! The taste, texture, color, it’s all perfect. Thank you!